Issuers from across Canada are joining the online investment platform this fall, including one providing a new route to reconciliation with Canada’s native communities. 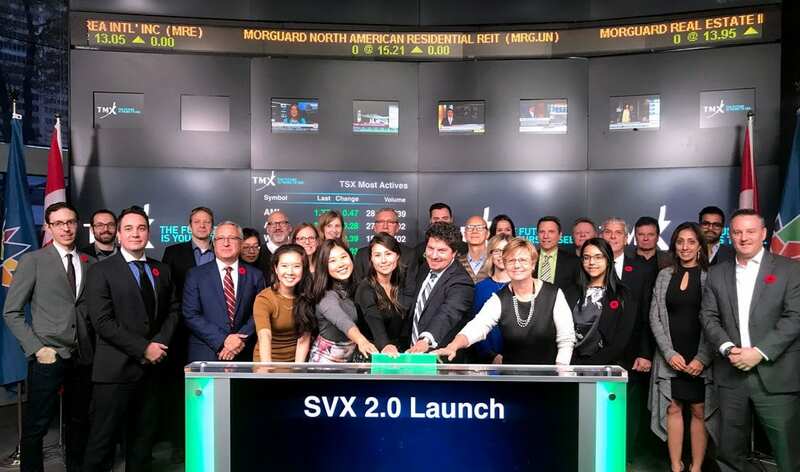 TORONTO, November 8, 2017 – Today, Social Venture Connexion (SVX) launched its new ethical investment platform at the Toronto Stock Exchange and announced a community of new issuers. SVX is the only platform in Canada focused on offering investment opportunities in companies that aim to do social and environmental good while making profits. Using the innovative SVX impact investment platform, the First Nations Bank of Canada (FNBC) has announced its plan to raise up to $7-million from both targeted Aboriginal investors and impact investors to support its fast-growing portfolio of loans to Aboriginal-owned businesses and individuals. The SVX issue represents the first opportunity for non-Aboriginal Canadians to invest in an emerging institution of national importance, one that provides a vital service to Canada’s young, fast-growing and increasingly entrepreneurial Aboriginal population. “Big banks do many things well, but they don’t do a good job with our communities, especially in remote areas,” he added. Another opportunity available to investors for the first time through SVX is the Immigrant Access Fund (IAF). Every year, IAF supports hundreds of immigrants by providing direct loans to help pay for the licensing or training. These and additional investment opportunities were announced on November 8th at the Toronto Stock Exchange, where SVX founder and director Adam Spence launched the new platform. Over 1,500 investors, entrepreneurs, and community members have attended in-person workshops, demo days, events, and other educational programming hosted by SVX since 2013. CoPower is an online marketplace investing in clean energy infrastructure that makes it easy to invest in energy efficiency and renewable energy generation projects that offer solid returns and predictable cash-flows, along with measured social and environmental impact. EarthShield is a pre-commercial agtech company that will produce an organic sprayed bio-resin called EarthSkin, developed to help farmers improve productivity, reduce costs, and promote a healthier eco-system. First Nations Bank of Canada (FNBC), founded in Saskatchewan in 1996, the majority aboriginal-owned bank has grown to include eight full-service branches and five innovative community banking centres in aboriginal communities across eight provinces and territories, serving 12,700 customers. Goodpin is a web-based platform that brings people, brands, and charities together. It enables brands to let their customers decide which charities should be supported, and then promotes those choices to encourage other customers to match, share, and celebrate the community’s impact. Immigrant Access Fund (IAF) is a national charity dedicated to helping skilled immigrants, including refugees, succeed in Canada’s labour market. IAF achieves this by providing micro loans of up to $10,000 for the costs of the licensing/training newcomers need to work in their field in Canada. An independent study showed the IAF program acts as an economic stimulant, with a return on investment for Canada of at least 900%. Lucky Iron Fish develops a cast-iron cooking tool which provides dietary supplementation to individuals affected by iron-deficiency anemia. Peekapak is a research-based and literacy-focused learning platform. It integrates concepts like self-regulation and empathy into ELA instruction in the classroom and home. QoC Health is an award-winning social enterprise that helps take digital health ideas to scale with its patient engagement technology platform. Sarona Asset Management is an institutional-quality, independent investment firm that delivers capital to entrepreneurs in under-served markets and helps them develop their companies and their communities with a balance of profit and sustainability. SolarShare is the largest renewable energy co-op in Canada in terms of membership and investment. It is a non-profit cooperative with a mission to grow community-based renewable energy generation in Ontario to enable a faster transition to a low-carbon economy. TAS develops mixed use buildings for public good. TAS believes that connected communities lead to beautiful, more resilient cities. Ulula manages risk of human rights abuses in operations across the global supply chains of companies. Ulula’s platform uses accessible communication channels to enable workers to identify risks and issues of concern about their workplace. SVX (@theSVX) is an impact investing platform for impact ventures, funds, and investors seeking social and/or environmental impact alongside the potential for financial return. SVX helps ventures raise capital across sectors including cleantech, health, work and learning, food, and social inclusion, providing support to enterprises focused on early cancer detection to community power co-operatives producing renewable energy. SVX works with all investors, from foundations and family offices to everyday investors, to help them identify opportunities and to support their decision-making efforts so they can match their money with meaning. SVX is a not-for-profit corporation, powered by MaRS Discovery District, supported by TMX Group Inc., the Government of Ontario, Torys LLP, and many other partners. SVX is registered as an Exempt Market Dealer (EMD) in Ontario, Québec, British Columbia, Alberta and Saskatchewan; however, no securities regulatory authority has approved or expressed an opinion about the securities offered on the platform.